You are responsible for your own safety while fishing in bear country. Whether fishing, traveling to and from your favorite fishing spot, or camping, be aware of bears. Don't make it easy for bears to find food, food containers, backpacks, garbage, fish, or fish waste. While camping during your fishing trip, make sure to keep a clean camp and to properly store items that could possibly attract bears. Dispose of trash in dumpsters or bear-resistant trash containers. Always keep food and food containers secure in your vehicle, recreational vehicle, or in a bear resistant container. Keep other items such as bags, backpacks, etc. stored in your vehicle, recreational vehicle, or tent. If you are in a remote location, dispose of trash by burning it in a campfire and then dispersing the ashes, or by storing it in a packable bear resistant trash container. Do not store them in your tent. When you catch a fish you intend to keep, immediately kill and bleed it in the water by cutting or ripping the gill arches. 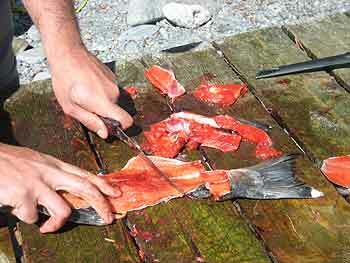 Bleeding into the water quickly clears blood from the fish, improving its quality while reducing the chance of attracting bears. If you are fishing from the river bank and not near your vehicle or other facilities, keep your bled fish on a stringer and closely attended (within approximately 12 feet of you). Keeping fish on a stringer in the water keeps fish cool and preserves meat quality. Do not leave fish exposed on the bank or in the woods, as the meat quality will be affected, while increasing the risk of attracting bears. If you are fishing from a boat or have accessed the river bank from the boat to fish, keep your catch close by, or better yet, secure your fish in the boat. Try to stay within a reasonable distance from your boat in case you are approached by a bear. At the end of the day, anglers should clean their fish at designated fish-cleaning stations, or at home. If using a designated fish-cleaning station, anglers should chop the fish carcass into many small pieces and throw them, and the entrails, far out into deep, fast-moving water so they don't wash back onshore. Do not leave entrails or other fish waste on the river bank or in shallow water. Another option is to bag up fish waste and dispose of it at home. If you clean your fish at home, place entrails and fish waste into the freezer until the morning of garbage day. Do not leave fish waste outside in garbage cans for multiple days, as bears will be attracted to the smell, even in town. A benefit of filleting at home is that it yields cleaner meat than when done in the field. Kenai and Russian river anglers are asked to take their fish home whole. If they prefer to fillet on the river, we ask they use the fishing cleaning tables that are provided at the confluence of the Kenai and Russian Rivers, and at the ferry site. When filleting, anglers are asked to Stop, Chop, and Throw (cut filleted carcasses into numerous pieces before throwing into the fast-moving current). For more information, please contact the Russian River Interagency Management Coordinator, Seward Ranger District (907-288-7739). A food storage regulation is in effect on U.S. Forest Service and U.S. Fish and Wildlife Service lands and waters in the area. All attractants, such as food, beverages, garbage and equipment used to cook, or store food must always be stored in a bear-resistant container, your vehicle, or kept within 3 feet of you. Once in possession, fish must be kept within 12 feet of you all at times, unless acceptably stored, to ensure that bears do not have access to your fish. For more information on how to live, travel, hunt and fish in bear country (most of Alaska), visit the Alaska Bear Facts webpage and State Parks website "Bears and You".